Top Best Smart Watches for Women: Shape Your Style! Today, fashion and technology are developing significantly together. You can find all kinds of high-tech garments in your wardrobe. Also, accessories, such as smart watches, are now very stylish and fabulous, which are a precious choice for modern women. They are ideal for your daily use, allowing you to access all the necessary information right on your hand. From messages to emails and other notifications, these fine design details can do much more than telling the time. Find out more in the following article, Review of top best smart watches for women. How Do I Choose A Smart Watch? Keep reading, and you’ll explore our guide to choose the best smartwatch for women with full functionality and style. Let’s get started with our suggestion list of 10 best smart watches for women. You will have an overview of some hot and popular smart watches for women in the market. With a comparison table of 10 smart watch products, you can know a lot about these products. However, we will provide more useful reviews so you can choose the best one for your demand. If you like a smartwatch in a classic style, the Samsung Gear S2 is ideal for you. With a round face, leather strap and a moderate thickness, the Gear S2 is designed by Samsung to resemble a traditional watch. 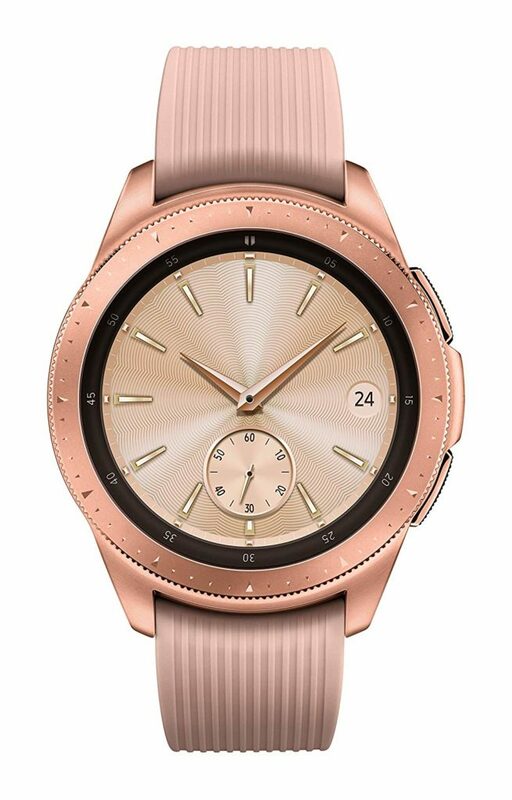 According to many reviews, Samsung Gear S2 Smartwatch is one of the best smartwatches on the market. The Gear S2 design looks better than any other smartwatch models running Android Wear. Equipped with the Tizen platform, it works well with both iOS and Android and has long battery life and high stability. Samsung also put a circle of gears on the watch face, and this detail helps you to switch application windows, scroll lists, menus, etc. It comes in handy when the watch screen is small and easy to stain if you use the touchscreen. The interface and the control system are quite user-friendly. In addition to displaying time, schedules, health monitoring features, heart rate measurements, Gear S2 has many applications to connect and work with smartphones such as news update tools, Facebook Messenger, Skype, Gmail, native apps, maps, and more. Despite being a Samsung brand with Gear S2, Galaxy Watch is greatly improved, giving you many outstanding features. Galaxy Watch has a sturdy metal design with a very feminine rose gold color and resistance to breakage, high temperature, dust, and pressure. Samsung provides a unique and luxurious design, powerful configuration, smart bezel rotation and many useful features, all of which make it a capable assistant for users in various activities. Moreover, this smart watch displays colors well even in outdoor environment, and every detail is clearly displayed. It also shows smoothness in all tasks and responds almost immediately to each gesture of user on the screen. Galaxy Watch runs on the Tizen 4.0 platform developed by Samsung, so the interface, features, and other details on the watch are best optimized. The device monitors your activity professionally such as walking, running, cycling or bodybuilding. GPS positioning helps you accurately track your activities and give specific parameters for you to know your current status so that you can make improvements. Finally, the Bixby virtual assistant can quickly perform some tasks for you by voice commands. The Samsung Pay allows you to add a credit card for quick payment with simple touch gestures. This product is aimed at female customers, so it is elegantly designed with sparkling stones surrounded, attracting your attention at first sight. 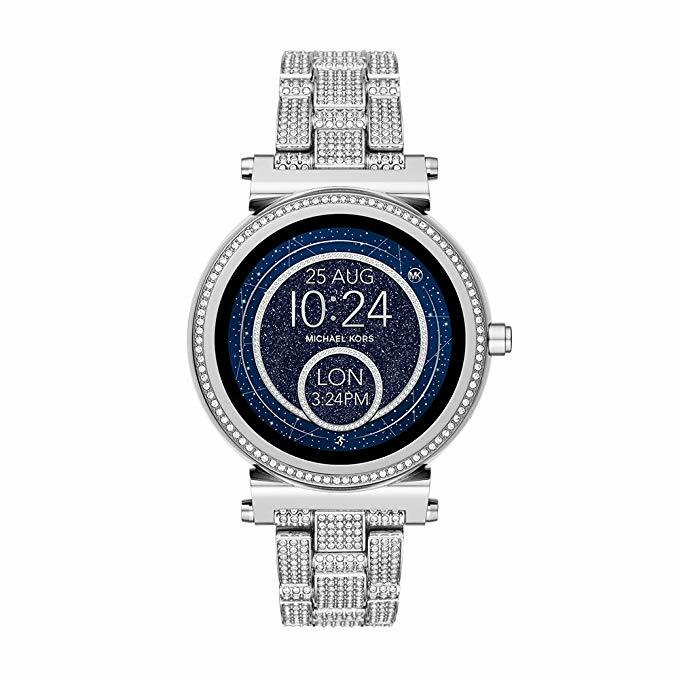 The high-resolution screen, which Michael Kors certainly pays close attention to, makes the watch face look so real.. The 42mm screen clearly displays message, email, and call notifications. The watch also runs Android Wear 2, so you can install a lot of apps directly on it and there is no need to depend on your phone. This product displays well in the sun. You also quickly removes the cord and replaces it. With the feature of IP67 waterproof, you should not take a bath or swim when wearing this bath. In addition, charging time is about 2 hours and you can use this smartwatch in about one day. Its Android Wear 2.0 runs fast and its tiny screen gives you smooth strokes. Overall this watch is very well-finished, comfortable to wear, and you can see the attempt of the manufacturers in designing the best smartwatch for females in hardware manufacturing. To meet the needs of Apple fans, Apple Watch Series 3 still retains the original design with a slightly curved edge at four corners, adds a red highlight button and uses the latest WatchOS 4 operating system. When using this watch, you can track your sports activities such as jogging or cycling. Its water resistance makes it convenient to practice swimming. You also have long battery life to use up to 18 hours, along with tracking heartbeat mode for your health care. Regarding hardware, many tech experts rate Apple Watch Series 3 as the most powerful and convenient smartwatch available today. The new Apple Watch is equipped with a dual-core processor for up to 70% faster speed, a new W2 wireless processor chip, LTE support that allows users to make calls without a smartphone. Apple Watch 3 will not have plastic bars to place the catch antenna, but the device’s screen will take on this role. Therefore, you can just lift the Apple Watch and make a call. You can even listen to music online via this smartwatch. However, to use this feature, you have to accept additional payments for the LTE version and the monthly amount to maintain it. If you enjoy standing out from the crowd, you can choose this watch right away. 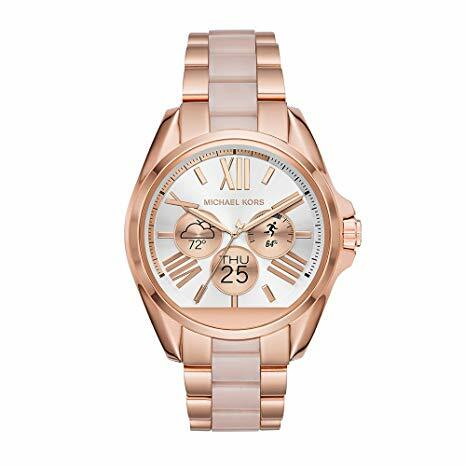 The Michael Kors Access Sofie has a very luxurious design, a stainless steel case, beautiful shining color, so it is suitable for social events with elegant outfits rather than casual wear. What features does this product also give you? It is one of the few Android Wear smartwatches with beautiful appearance, screen resolution of only 390 x 390, so the display image is lively and bright enough to look outside. The watch is extremely light and not bulky but wears a bit uncomfortable if you’re not familiar with stainless steel band. Its performance runs fast thanks to Qualcomm, Snapdragon Wear 2100 processor, with 512MB RAM, there is no lag or slow reaction. You will also have Bluetooth 4.1 and Wi-Fi connectivity, IP67 waterproof and dustproof. Furthermore, you can swipe through the interface or open the application quickly and smoothly. Also, it has 4GB of storage so you can store music on a smart watch and play via Bluetooth connectivity headset. A product comes from brands that stand on the watch market for 34 years and occupy a certain position in the choice of customers worldwide, the Fossil. What does this product stand out compared to similar products in the market? The Fossil Q Venture HR has a simple circular touch screen with clear and easy to navigate display. It still retains the three right-hand navigation buttons, acting as a shortcut to the most commonly used application. It is also integrated with Wear OS by Google to be compatible with iPhone and Android phones. This operating system and 4GB of memory are enough for the clock to run smoothly. The watch is equipped with additional NFC connectivity that allows you to make payments via Google Pay. Also, it has a water resistance standard of up to 5 ATM and an optical heart rate monitor. The beautiful watch exterior is designed with classic stainless steel material in rose gold color and crystal added. You choose other material straps like leather, silicone or stainless steel thanks to compatibility of the watch with all 18mm strap. This watch has three preset watch faces and 39 different options to choose via the Wear OS application or clock setting. It owns separate GPS, so do not need to connect via phone. In short, Fossil Women’s Gen 4 Q Venture HR has excellent design and smart features which are simple to use. As the name of the product, Samsung Gear Sport Smartwatch is produced with classic design and modern features for sports. It can record the swimming process with the built-in Speedo On application. To complement the sports support features, this smartwatch also has the 5 ATM water resistance, continuous heart rate monitor to automatically detect activity, customize target and alert you to help you perform well the set objectives. This watch is suitable for women thanks its round face, durable and luxurious Gorilla Glass toughened glass surface, and a raised clock face that looks bulky but quite light. You can wear Samsung Gear Sport comfortable and fit on hands, even when you have small wrists. For the high performance, Samsung has equipped Gear Sport with Samsung Tizen platform, a dual-core processor, 4GB of storage, and 768MB of RAM. You can connect the watch via Bluetooth 4.2, NFC, and GPS. The watch 300mAh battery can last for four days or 14 hours with continuous GPS operation. To sum up, this smartwatch design can make you feel attractive, with an impressive swivel dial, easy-to-wear silicone strap, and enough AMOLED screen under sunlight. And also the water resistance up to 50 m support you to bathe and swim comfortably. An LG smartwatch is up-and-coming, giving you a complete and thorough experience with the latest Android Wear 2.0 operating system. This smartwatch makes excellent use of Android Wear 2.0’s new features such as a new watch face, improved workflows, new methods to use apps and more ways to stay in touch with family and friend. What special features and design do you own with this watch? The LG Watch Style has a 1.20″ screen, 240mAh battery, no LTE, GPS, and NFC. It is also thinner, more compact and comes in yellow, gray and black. LG produces their watch with built-in Google Assistant assistant and dialer support with the spin button. So you can navigate through menus, select applications and quickly launch Google virtual assistants. It is designed with a round dial, metal rim, and 18mm small strap. You can choose leather or silicon strap. You can connect via 4G LTE wireless, use card payments right on your wrist with Android Pay. If your hobby is listening to music, you can enjoy with Google Play Music on this watch. The proper waterproof and dustproof of LG Watch Style make it durable. Variety of colors and 42mm size will be suitable for buying watches for women. And that is the design of Moto 360 Gen 2. This smartwatch gives you many strap materials such as a leather strap or metal wire, so you can easily replace the strap depending on your lifestyle. The clock still runs the latest Android Wear from Google. A small change that brings you convenience is the function button on Moto 360 Gen 2 moving to 2 o’clock position compared to the 3 o’clock position in the previous generation. However, one point that most users underestimate of this product is part of the screen being masked, but according to Motorola, this is the position where the light sensor is located. As a smart watch, you can use the Moto Connect app to have a wide choice of clock interfaces on the surface without changing Android Wear critical applications. The watch is also equipped with an optical heart sensor and integrated features from Moto Body for optimal support to monitor daily activity and health. Moreover, the app interface is quite eye-catching and user-friendly, including a control panel, goals and daily graphs for calorie burning, step count, and heart rate. Health training platform is based on Google Fit to help you a lot in physical and mental exercise. Michael Kors brand always brings sophistication in design so there are many models especially suitable for women. One of them is the Michael Kors Access Women Sofie. This smartwatch is made of stainless steel, perfectly combining the technology and dynamic style of the famous brand. It has the Android Wear, so you can connect it with your favorite applications and other Apple and Android smartphones. How about the features of sports support and personal customization? With built-in fitness and health tracking via Google Fit, you can know your daily calorie consumption, steps, and distance. You can also receive notifications for calls or alerts and quickly customize the clock interface to your personal preferences. Besides, you will get help while on the go with Google Assistant on this watch. The bands can be interchangeable, so you have a watch that fits your interests. It can be said that the style, fit, perfect looks and high quality of this smartwatch are for your choice. The smart watch is a device that has the features of a regular watch to watch the time, timer, alarm and equipped with many modern intelligent features such as health care, heartbeat and step measurement, etc. Besides, it can interact with a smartphone to receive and reply to messages or calls. The smartwatch manufacturer has an initial design goal for this product to become a useful smartphone support tool. Compared to regular watches, these products have a color screen, sim slot, memory card or even a camera. Smart watch was launched to support maximum daily operations, for example, you can answer or reject calls, control music player, view photos, check smartphone batteries, see notifications, and more. Besides, the smart watch uses a separate operating system, and is almost like Android mobile source code, but is designed to optimize the interface, functionality and better power management on a small watch face. Prices are suitable with your consumer budget. The watch has advanced operating system to run smoothly and prove user-friendly features. It has a stylish design and is suitable for women. However, this belongs to personal preference so you can choose which clock you like best. You can use the watch all day with long-term battery capacity. It has the function to support your health monitoring. The notification system is clear and easy to control or customize. The application is diverse and plentiful, satisfying for your needs. The watch face can be customized to your taste. The clock has a touch screen for your convenience. With the features and reviews we provide to you, the choice is in your hands. Our list of top best smart watches for women is a suggestion that you can choose to buy the most suitable product. Now it’s your turn to go to a local shop or online website and pick a smartwatch for you. Anyway, this is a fashion accessory for women, so you can consider where you can wear it, what clothes to use and the support features needed for your daily work and activities. Does Michael Kors Smartwatch Work With iPhone?